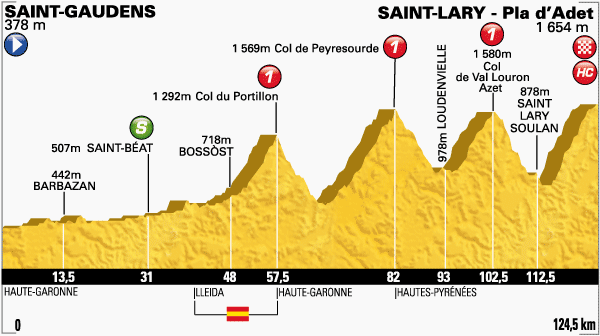 Beginning with an F1 style grid start, the incredibly short 65km Stage 17 from Bagnéres-de-Luchon to Saint-Lary-Soulan is intended to light a fire beneath the general classification, if not a stack of C4. With an astounding 3200m of climbing in such a brief time, this will be a brutal affair which is likely to transform cracks of weakness into gaping voids within a few pedal strokes. The finale is atop the monstrous Col du Portet, demanding more than 2000m of climbing itself from bottom to top, destined to see some riders succumb to its fierce slopes. Romain Bardet must attack today if he is to have anything to help limit his losses in the upcoming individual time trial. Such an intense stage will lend itself well to his explosive nature, while the distance will also make it harder for his rivals to calculate when to reel him back into the lead group. Tactically astute and looking strong, a well timed attack upon the Col du Portet may cause havoc amongst the general classification group. Chris Froome will look to take advantage of those attempting to crack yellow jersey wearer Geraint Thomas, keeping his powder dry and pouncing with a full gas effort when the opportunity appears. Renowned for his high cadence attacks on the steepest of climbs, the day’s concluding ascent is going to be decisive and lends itself well to Froome’s ability to drill his way to the summit. Depending on how teammate Thomas performs, there is a strong possibility that Froome will finish the day with a stage win and the maillot jaune. Adam Yates was unfortunate yesterday when crashing on the final descent while looking on course to secure his first Tour de France stage win. However, the British rider has already commented on how much more suitable today’s course is for him, signalling that he still feels strong enough to contest honours after his efforts yesterday. With no real threat to the general classification, there is every chance Yates will also be gifted the freedom to attack while the bigger names simple stare at one another. Tom Dumoulin, Steven Kruijswijk, Mikel Landa & Nairo Quintana all know that they need to perform strongly today, though it might simply be a case of survival for these, as their chances of genuinely putting time into the duo of Geraint Thomas and Chris Froome looks as tough as the Col du Portet itself. Much has been made of Stage 17 and its individual time trial as being the defining moment of this year’s La Vuelta a España, a day where many could see their overall ambitions sink without trace and where one rider could perhaps even win the tour outright. Today’s 38.7km race against the clock offers little in the way of salvation for the climbing specialists who currently sit towards the upper tier of the general classification. Instead, the long and wide open roads which thread their way in and around the city of Burgos will favour the big engined time trialists who twirl huge gears as if it were the Sunday club run to the nearest Café. Many are bound to find themselves overexposed after a tough Vuelta a España which has continually sent them into uncharted territory in order to test themselves against monstrous gradients never seen before at the race. If there was ever a time during these three weeks to rally every ounce of energy and engage all possible muscle fibres for around 45mins worth of effort, it is today; capitulation here will not merit a place on the podium in Madrid. Tom Dumoulin is expected to dominate proceedings today and possibly place himself upon an infallible path to becoming the first Dutch grand tour winner since Joop Zoetemelk won Le Tour de France in 1980. Dumoulin is one of, if not possibly, the best time trialist in the world this year and is many pundits favourite to walk away from Richmond, Virginia in a few weeks time with the rainbow bands across his chest. He heads into today’s stage 1’51” behind race leader Joaquim Rodriguez, an achievable margin to overturn on a course which does not favour his Spanish rival; as Rodriguez’s best time trial performances have come upon much tougher rolling terrain. The biggest cause for concern in regards to Dumoulin’s chances of winning Stage 17 and putting considerable time into his general classification rivals is the level of fatigue with which he enters today. However, other than Stage 16, he seems to have paced the majority of his defensive work very well in the mountains and he should be strong off the back of a rest day. Vasil Kiryienka should be considered the greatest threat to the hope of a Dutch win on Stage 17. The Belarusian Sky rider is known for his immense strength and ability to churn over huge gears at the front of the peloton in the face of severe gradients. Recent years have seen him finish 3rd and 4th (on two occasions) at the World Championship Individual Time Trial and should subsequently ring alarm bells for others with eyes on the win today. His form at the World’s clearly indicates an ability to exit the Vuelta a España in fantastic condition which allows him to contest the podium places in recent years at the event. This should mean Kiryienka is the man most likely to stand between Tom Dumoulin and stage victory in Burgos, his easier race thus far perhaps even giving him the edge. Stephen Cummings is known for his affinity for prologue or similarly styled time trials, but today will come as a great opportunity to impress his team with the hope of securing a spot at the World’s later this month. The British rider has enjoyed a fantastic year at MTN-Qhubeka, a move which has offered him a greater level of freedom and subsequently reaped the benefits of such opportunities afforded to him. Though it is difficult to see him bettering Dumoulin and Kiryienka, a podium placing could be an achievable target. Jurgen Van den Broeck has altered his ambitions as of late and used this year’s La Vuelta a España as a springboard to acquire condition ahead of the World Championship Individual Time Trial. The Belgian has rediscovered his prowess against the clock and perceives it to be strong enough to warrant burying general classification hopes in the meantime, in order to focus upon Richmond, Virginia. The predominantly flat terrain will allow him to put down the power, while any kicks in the road will not worry this strong climbing Belgian. Beyond those mentioned above, little remains in the way of riders truly blessed with the skill set required to dominate a time trial such as this. However, due to the attrition rate at the Vuelta, this does mean much of the day’s placings will be influenced more by condition rather than talent, so unexpected performances are more plausible. This is bound to mean Fabio Aru will place relatively highly, due to the lack of depth of time trialists and could perhaps even offer Joaquim Rodriguez a higher placing than expected too. The Spaniard has displayed great performances against the clock this season, but this will be very difficult to produce on a course which does not play into his strengths at all. Aru on the other hand is a competent time trial rider and should be the one to make the biggest gains in the general classification beyond Tom Dumoulin. 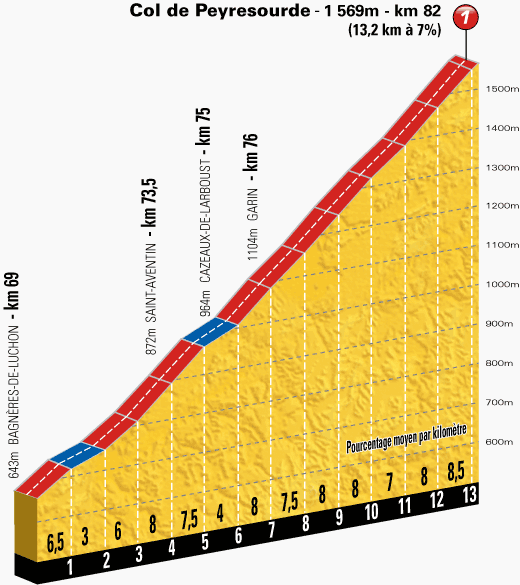 Rafal Majka should also benefit today, while Mikel Nieve and Esteban Chaves are likely to lose a considerable amount of time due to the lack of climbing here. Though only yesterday, the rest day will seem a million years ago for many in the peloton on Stage 17 of 2015’s Le Tour de France; sending the riders headlong into an Alpine summit finish for their first day back in the saddle. Tasking them with an 161km long trip from the start in Digne-les-Bains to a summit finish upon the historic Pra Loup climb of the Alps. For those not so immersed in cycling folklore, the ascent of Pra Loup was the scene of a rare sight during the 1975 Tour de France; the dethroning of Eddy Merckx by Bernard Thévenet. If that in itself does not ring any bells, then perhaps the fact an almost identical route and finish was used during this year’s Critérium du Dauphiné will; Romain Bardet emerging victorious after attacking on Pra Loup’s preceding descent on that day. Essentially, it is safe to say that the peloton will be plenty well versed enough to anticipate what exactly awaits them on this first day back in the moutains, the favourite poised to ignite their last chance efforts to force Chris Froome out of the maillot jaune before Paris. The day’s account is opened by the Category 3 Col de Leques (6km, avg 5.3%) which tops out at the 40km marker and serves as a moderate warmup ahead of Stage 17’s schedule. A further 27km down the road comes the summit of the second of the day’s climbs, the Category 3 Col de Toutes Aures, one hundred meters longer than its predecessor but offering an easier gradient of 3.1% to be conquered. A brief descent follows on from here and places the riders at the base of the Category 2 Col de la Colle-Saint-Michel, a much longer climb at 11km and averaging 5.2% from start to finish. The summit of this climb will come just before the century mark at 96km of riding, running immediately into another brief downhill section. Stage 17’s intermediate sprint appears slightly further down the road after 111km of racing and is bound to see Peter Sagan mixing it up again; if the break have not swept up all the points before the Slovak passes through. Onwards from this brief competition, the road segues straight into the ascent of the day’s solitary Category 1 climb; the Col d’Allos. This 14km ascent will soon begin to offer us up an indication of who is in good form during the day’s ride to Pra Loup, though billed as 5.5% on paper for the entirety, it is the testing 6km run to the summit which fluctuates between 6% and 8.5% which will be the battle until they drop down the other side. 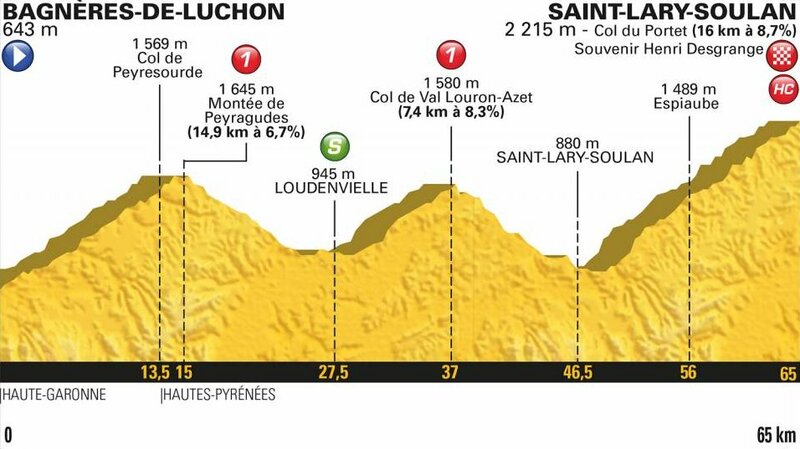 From its summit, a little over 20km will separate the peloton from the summit finish of Stage 17, Pra Loup sure to be dialling up the anxiety as they drop down to its opening slopes. If the impending rush to win the was not enough to add fuel to the fires of stress, the descent which connects the two final climbs is also technically demanding and is sure to act as a launchpad for a gifted climber to gather an advantage on the downhill before scaling the gradients to Pra Loup. 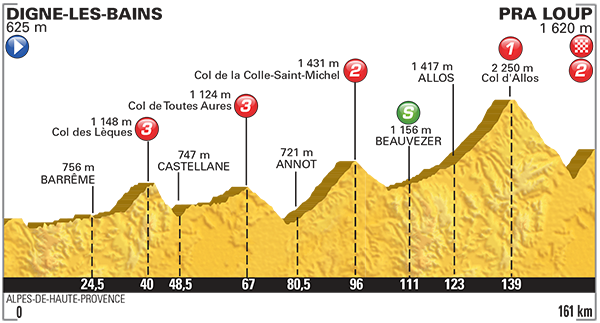 Given that its length is only 6.2km in total, some may consider the anticipated drama to occur here to be over exaggerated, but there is sure to be enough action to bring the frontrunners to the fore and see some serious defending of the yellow jersey by Chris Froome. The gradients here are stated to average a constant 6.5%, though its final kilometre is set to make for some interesting viewing as it spikes upwards to 8.5%. A short finishing straight will decide the day, only 80m in fact, meaning there is little imperative for somebody who rolls well on the flat to make the cut upon the final climb unlike Stage 14. The opening Alpine salvo of 2015’s Tour de France is sure to lure some riders out who began this race in Utrecht with well founded ambitions of featuring towards the pointy end of this year’s general classification, but now find themselves separated by around ten minutes to current leader Chris Froome. However, despite many perceiving a gradual demise of Team Sky’s strength due to the abandonment of Peter Kennaugh and the ailing form of Richie Porte, Wout Poels and Nicolas Roche; Chris Froome might decide to strike out once again and demonstrate his dominance. Though not wishing to jinx him, there is a great misconception about Froome’s ability to descend, a total absence of evidence to suggest he cannot keep pace with the likes of Alejandro Valverde or Vincenzo Nibali. Assuming he stays within 15 seconds of a rider such as Valverde heading into the opening sections of Pra Loup. There is little to argue against Froome taking yet another summit finish victory at Le Tour de France. As stated above, Alejandro Valverde appears to be a likely contender to attack on the final descent and try to gain an advantage to his rivals before turning onto Pra Loup. The descent is technical, meaning Froome may decided to back down on the pace somewhat in pursuite of Valverde, allowing the Spainard to start the ascent to home solo; a climb which suits his attributes well given its distance and gradients. If away late into the stage, Froome will not wish to work too hard to bring him back, as their is a strong chance of Nairo Quintana then immediately counter-attacking as soon as his teammate is reeled back in. AG2R will be confident of featuring in some form during the finale of Stage 17 and Romain Bardet should be confident of animating the race given his recent winning performance on almost the exact same course during this year’s Critérium du Dauphiné. The young Frenchman appears to be finding his legs at last and is likely to invest his efforts heavily during this Alpine conclusion of the tour after his general classification hopes failed to make it through the opening week. There is obviously the chance that his focus will instead be placed upon cementing his top ten general classification placing, as those sitting around him will not be particularly fond of seeing his bike vanish up the road during their ride down Col d’Allos. Of those who entered his race has contenders for the overall win, Vincenzo Nibali is now the rider likey to be given the most freedom to attack on a stage such as this. Little needs to be said of the Italian’s prowess for descending, a talent which would set him up well if deciding to attack as soon as the summit of the Col d’Allos is reached. As little as thirty seconds could be enough of an advantage for Nibali to fend off his pursuers on Pra Loup, but it will be hard to pull out such time if the likes of Chris Froome and Alejandro Valverde wish to keep him on a tight leash. Entering this final week, Nibali does look to have begun finding his climbing legs once again, but he will need a reasonable cushion to emerge victorious atop Pra Loup. Nairo Quintana has the possibility to begin pulling back time from Chris Froome on Stage 17, the Col d’Allos and Pra Loup an enticing combination which could see the Colombian attack hard on both ascents. As mentioned earlier, Froome is beginning to appear isolated in the latter stages of these mountain days and has the potential to start creaking under the pressure of his Spanish speaking rivals. With teammate Alejandro Valverde equally well poised to attack Froome, the Movistar combination could finally strike gold if they play their cards right. Though Romain Bardet’s win on a carbon copy stage at this year’s Crtéterium du Dauphiné was the main headline, eyebrows were slightly raised after Tejay Van Garderen’s performance saw him take four seconds out of his rival Chris Froome. Though it is unlikely to see the American fighting for the win here, it should be monitored as to how well he copes with his general classification rivals attack; possibly making a move himself yet again to take a handful of seconds. Two noteworthy riders currently placed in the top ten overall are Robert Gesink and Bauke Mollema, who could contribute a surprising amount of energy into pursing a rider such as Vincenzo Nibali; stopping him from leapfrogging Gesink or pulling away from Mollema. On the road, both are finding their climbing legs at last and are often dangerously underrated on a stage finish such as this. Both have the ability to lay down high tempo attacks, but it is Mollema who stands out as the most likely to attempt such a move in the final kilometres in order to gain time on the general classification. Of course, a breakaway winning on Stage 17 remains a strong possibility, especially if the dynamic of strength and size is struck spot on when going clear. Simon Yates has been ill during Le Tour, but stated that his ambitions were to rest and actively recover as best as possible, before then coming to the fore on his favoured Alpine climbs. If Romain Bardet fails for AG2R on today’s stage, Alexis Vuillermoz will be waiting in the wings to take over and lead the charge in either a breakaway or elite group of contenders which reaches Pra Loup first. He was only 1:37 down on Bardet during that Dauphiné finish this year and has already demonstrated his form by winning on Stage 8. Yet further French hopes can be flown by Pierre Rolland, who is in good condition, but is not always best positioned to follow the right moves. Having finished within a minute of Bardet on Pra Loup at the Dauphiné, he must feel confident of mounting a serious charge once again on Stage 17’s same finale. The South-African Louis Meintjes is well worth a mention on a day such as this, he has looked strong throughout the mountains for the most part so far and placed 6th (50″ down) when Bardet took the Pra Loup win last month. Others worth keeping an eye on are Daniel Martin, Rafael Valls, Mathias Frank, Joaquim Rodriguez, Wilco Kelderman, Ryder Hesjedal and Andrew Talansky. Another rolling day awaits the peloton in this final week of the Giro d’Italia, once again calling upon the swashbuckling exploits of the breakaway specialists to seize control and prevent the sprinters from deciding the win. Coming after the previous day’s monstrous terrain, Stage 17 offers tentative recovery for the survivors so far, but plenty will find the motivation to dig yet deeper and muster a stage winning charge into Lugano. 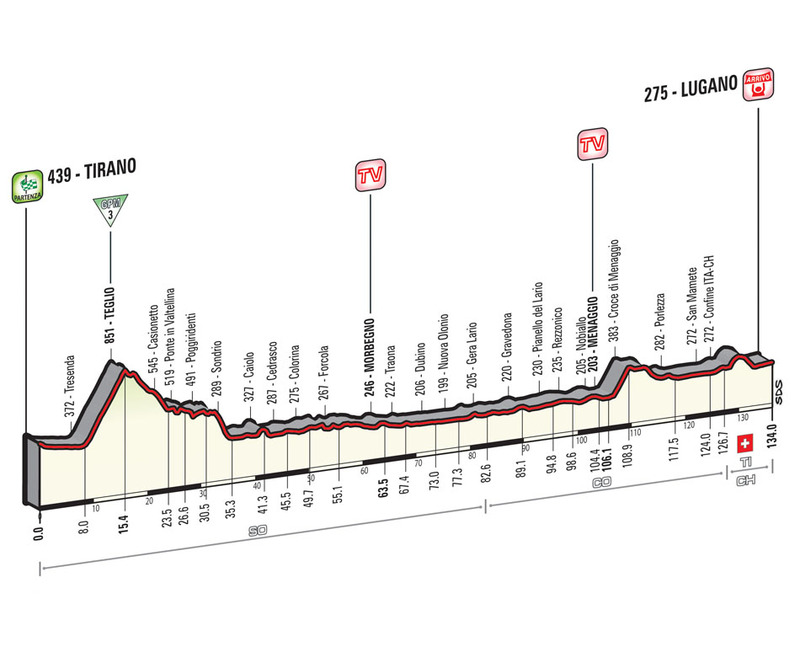 If the quick men play their cards right, there is a chance that the 134km trip from the Italian town of Tirano to Lugano in neighbouring Switzerland, could still end in a sprint for the strongest remaining men. Many will have had their fill of mountains for the foreseeable, so the organisers have only placed one categorised climb during the day, but this does come almost immediately after the race starts. The Category 3 climb to Teglio reaches its peak after only 15km of racing, the ascent itself being 7.4km at an average gradient of 6.5% (max 10%). Descending from here down to around Caiolo shall signify the start of an extended passage of flat or gently rolling terrain which lasts for 70km until they reach Menaggio. At this point they will tackle the short and sharp Croce di Menaggio, only 2.8km in length, but a reasonable grind with an average of 6.4%. Having completed this, the leading group or peloton will sit a little over 20km from the finish in the Swiss town of Lugano. A couple of tricky bends and a mixture of road furniture are present during the final 10km of racing, along with a short hill with less than 5km remaining, but once safely navigated, the final bend with 750m remaining could set up a drag race for the fastest men still present at this year’s Giro d’Italia. Opening with such a significant climb early in the stage should set the foundations for a reasonable breakaway to make their move and go clear of the peloton after less than 20km have been raced. Considering this as a fact for a moment, the attention must then be turned upon who exactly would be taking the reigns and leading the chase from behind. Having seen André Greipel abandon earlier in the race, Lotto-Soudal’s usually dominant presence on the front to bring back the break will be absent, leaving less well equipped teams to lead the charge for the sprint hopefuls. If a breakaway manages to go clear with a high proportion of teams represented within their ranks, the impetus to chase will dwindle drastically, ensuring a maelstrom shall be unleashed as riders scramble to make the cut on a day where anyone could win. Realistically, only a handful of teams have the motivation and personnel to drill it on the front all day in pursuit of securing a bunch kick for their sprinters. Lampre-Merida have proven to be one of the best lead out trains during this Giro and they will certainly have an interest in setting the day up for Sacha Modolo to take the win. However, they have often benefited greatly from the work effort of Lotto-Soudal and subsequently kept the powder dry of Roberto Ferrari and Maximiliano Richeze who have been key in delivering Modolo into race winning positions at this tour. If it comes down to another sprint, Lampre-Merida will be favourites to boss it within the final kilometres, but the work they have to do to gain this opportunity might hamper their finale. Giacomo Nizzolo was just shy of beating Modolo earlier in the sprint for a stage win and would have had a strong case of arguing that his compatriot sprinted from his line late on in the contest. However, he viewed this as coming with the territory and now enters Stage 17 with a great chance of taking his first ever Giro d’Italia win. His Trek Factory Racing team could certainly come to the fore and aim to contain the breakaway’s lead during the day, if they succeed and set it up for a sprint, the longer finishing straight is beneficial to a man who probably sits as second fastest on paper now. The greatest negative aspect for the likes of Nizzolo and Modolo is how the conclusion to this stage does not include enough technical corners late on where positioning is imperative, diminishing the importance of top speed, as a sharper acceleration over short finishes are often enough when exiting a late corner. Given that today’s finishing straight is 750m in length and lacks anything consistently tricky preceding it, Elia Viviani will fancy this immensely as an opportunity to take his second win and tighten his grip upon the maglia rosso. On paper he is the fastest man still in contention for the sprints and could use this to great effect on a long finishing straight which is usually the hunting ground of André Greipel. The Italian rider will also now find himself better supported in the lead out since Richie Porte departed the race, while Leopold Konig sits too far down on the general classification to warrant protection afforded to riders such as Fabio Aru and Alberto Contador. If Sky do a good job of protecting Viviani late on, he is well versed in taking the best wheel of a rival, before erupting with a top end sprint which is difficult to close the gap to. Fabio Felline has proven to be in immense form during this grand tour, demonstrating an aptitude for sprint finishes and making his way into the breakaway during hard mountains days. This causes a serious headache for his team Trek Factory Racing, who must be considering supporting him in a possible sprint rather than teammate Giacomo Nizzolo. With a big climb earlier on and two further hills in the final 25km or so, Fabio Felline suits this course particularly well should it happen to end in a sprint. He is clearly able to cope with the terrain and a possible lead out which could include Nizzolo is likely to see him finish well as they approach the line. A slightly shorter finishing straight is likely to have suited him better against the likes of Sacha Modolo and Elia Viviani, but Felline shall remain a man worth watching if allowed to take control of the team during the finale. Moreno Hofland was not far off Elia Viviani during the first sprint of this year’s Giro and has appeared in good condition as of late; possessing a top speed which could see him at least secure a podium on Stage 17. Another rider warranting respect is Luka Mezgec of Giant-Alpecin, the Slovenian hitting great condition towards the end of last year’s Giro; eventually taking the final day’s sprint finish. Factoring in the attritional nature of the last week, Mezgec’s freshness and top speed is likely to close the gap to his rivals. As mentioned earlier, the breakaway have a strong claim for staying away all day and a man who would see himself as the strongest from a small group sprint would be BMC’s Philippe Gilbert. He has looked extremely strong during this tour and possibly should have struck greater success beyond his extremely impressive stage win on Stage 12. His team are likely to play a huge role in his chances today, especially with a big climb coming so early in the day; BMC shall support Gilbert all day and protect him until the final 25km. It is here he could decided to attack solo at any point and try to form an elite group which will then take it all the way to the line, in this situation he is sure to be extremely difficult to beat. In regards to the breakaway staying the course, the riders possible of making the cut and winning in Lugano are dictated more due to freshness now than suiting of the course. Because of this factor, the door is wide open to those who have not really featured thus far and will be eager to stake their claim on a day where the peloton might struggle to muster a cohesive chase to those out front. Luis Leon Sanchez, Sylvain Chavanel, Rinaldo Nocentini, Maciej Paterski and Giovanni Visconti are all likely to feature in the day’s battle to make the breakaway and would form a difficult group to chase down in the latter stages if so. The peloton have already spurned one chance during this year’s Giro d’Italia to guarantee a sprint finish and they are likely to view Stage 17 as the best chance to balance the scales and set up a bunch kick in Lugano. Though the final kilometres do include a couple of tight corners, the 75om finishing straight should lean more towards those with a faster finishing speed than simply those who can accelerate fastest out of the final corner. Elia Viviani will find his attempts to secure the red jersey bolstered by the presence of new found support since the abandonment of team captain Richie Porte and could be underestimated by many to take the win here. Giacomo Nizzolo and Sacha Modolo have the lead out teams capable of guaranteeing their presence in the finale with a well organised and extremely fast final few kilometres; Modolo possessing the better team while Nizzolo is considered the fastest of the two. During the race, Fabio Felline might find himself handed the leadership of Trek Factory Racing ahead of Giacomo Nizzolo, he has performed impressively as of late and could win from either a bunch kick or breakaway. 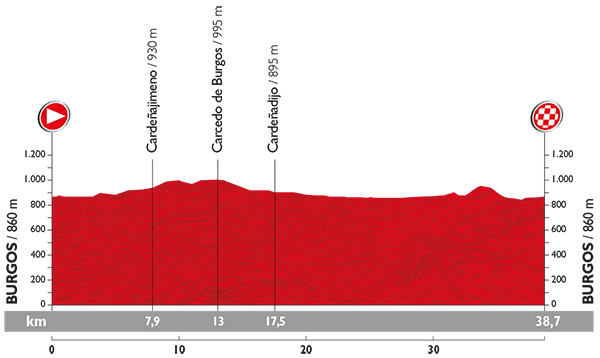 Likely to be the last bunch kick for the sprinters, Stage 17’s 190.7km trip from Ortigueira to A Coruña will be heavily targeted by the fast men, but no promises shall be made over its rolling terrain. Though a breakaway could take the win here today, given that the sprinters will have no further chances to take a stage win, it would be embarrassing for them to let this slip away from under their noses’. Despite not appearing completely level on the official stage profile, none of the uphill sections are categorised during the day and the concluding 1.5km are flat. A small climb is present at 3.5km, but even if anyone should get away, the resulting 1.5km as mentioned will be enough to reel them in. The risk factor for anyone wanting a bunch sprint is the possibility of a strong medium sized group still being away with 5km left in conduction with a poorly organised chase behind. A lot has changed since we last had to consider a possible sprint finish; Nacer Bouhanni has gone home, Giant-Shimano lost Lawson Craddock and Astana are firmly backing Fabio Aru over Andrea Guardini. All of this could result in a lack of firepower when it comes to chasing a breakaway down in the last 25km. FDJ.fr certainly have no reason to chip in with the workload of John Degenkolb’s Giant-Shimano teammates for example, but they should find some aid in the shape of Orica-GreenEDGE, Lampre-Merida and possibly even OPQS. Michael Matthews, Robert Ferrari and Tom Boonen being the reasons behind this, but none have show enough evidence on such terrain to suggest they will get the better of John Degenkolb. Matthews looks in good form, but the finish is not really tough enough to play into his hands for a late surge to the line. With good positioning and a late surge, Roberto Ferrari can be a major threat on some days and displayed this during the first sprint of this year’s Vuelta. In the last bunch quick, Tom Boonen was a solid second place and looked to have had the legs to take the win with a bit more road, he will fancy Stage 17 as the course’s rolling nature will entice him to have a serious go. Even after crashing hard, John Degenkolb has proven how strong he is by continuing to beat the best sprinters around him when the terrain is favourable. 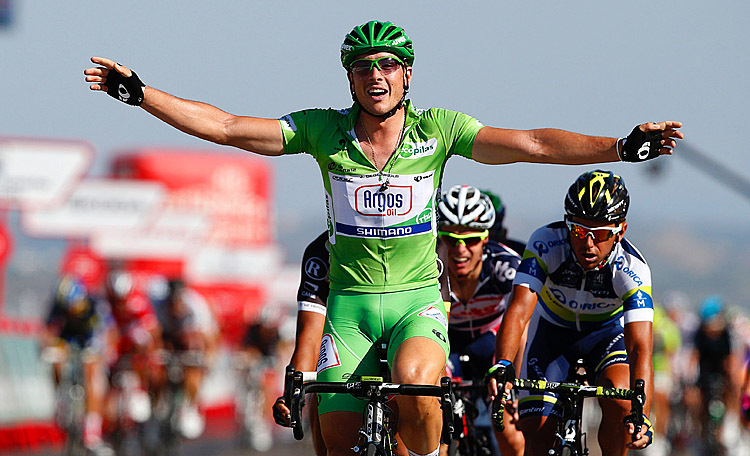 Stage 17 should be the same yet again, a simple enough finish and the strongest remaining lead out team in the Vuelta will only require Degenkolb to strut his stuff and unleash his raw speed to win again. Tom Boonen is clearly tapering his form nicely for the World Championships and could use this day as a dry-run by pushing Degenkolb close for the win. Four climbs of category 1 or above will see greater activity from the favourites on Stage 17 than yesterday’s descent fuelled antics. No doubt a breakaway will make dash for it from the drop of the flag, but with the opportunity for riders to gain time upon the summit finish, the peloton will be eager to keep them on a tight leash to allow the GC men to fight it out. The Pyrenees are a relentless rollercoaster of draining climbings and mentally tiring descents with no rest upon the rolling flat. This will be one of the hardest days in the saddle of the 2014 Tour. After the day’s brief trip into Spanish territory, the peloton will find themselves approaching the historic Col de Peyresourde with two more testing climbs remaining. 13.2km at 7% will not be very concerning for the riders, the Peyresourde fluctuates only gently beyond its average gradient; though it will be a leg sapping experience nonetheless. 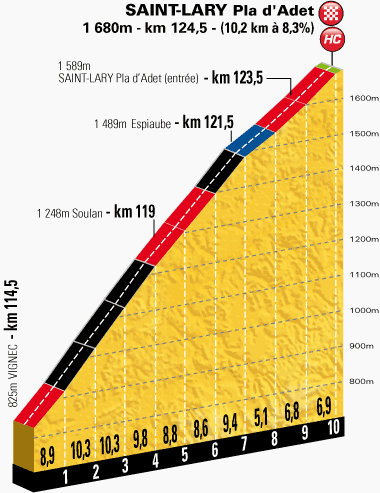 Today’s finale is going to be explosive as the summit finish to Saint-Lary Pla d’Adet offers the podium rivals launchpads for damaging attacks. 10.2km with an average of 8.3% is hard enough, but the bunch will also encounter ramps in excess of 10% along with winding hairpin bends to add greater anxiety too. Thibaut Pinot appears to be in awesome form right now and having seen himself distance Vincenzo Nibali briefly the previous day, he will not hesitate to expose his rivals once more. Inevitably, such an attack will lure Alejandro Valverde, Romain Bardet, Jean Christophe-Peraud and the usual subjects to control possible time losses before the time-trial. Leopold Konig is still on the lookout for a stage win and has been riding very well, but I think the ultimate winner of the day will be Vincenzo Nibali. Joaquim Rodriguez and Rafal Majka may also find themselves fighting a smaller battle today in the name of the Polka Dot jersey, but a stage win for Nibali could leave that battle a redundant spectacle.